Dr Hussein is the manager of an MSF-supported hospital in east Aleppo, where he also works as a paediatrician. He left Aleppo to celebrate Eid Al Fitr outside the city, but has been unable to return since the last remaining road into east Aleppo was cut in July. He hopes to be able to return to his hospital as soon as possible to continue delivering care. "We used to provide lots of services at this hospital – surgery, paediatrics, intensive care, internal medicine. But the bombings in east Aleppo over the past month forced us to focus on the increase of war-wounded patients, which became almost 80% of our work in recent weeks. Before the siege, the hospitals used to see between 8,000 and 10,000 patients a month; this was halved by the beginning of July. Not only that, but also most of the patients then were war wounded, with a number of internal and paediatrics emergencies. 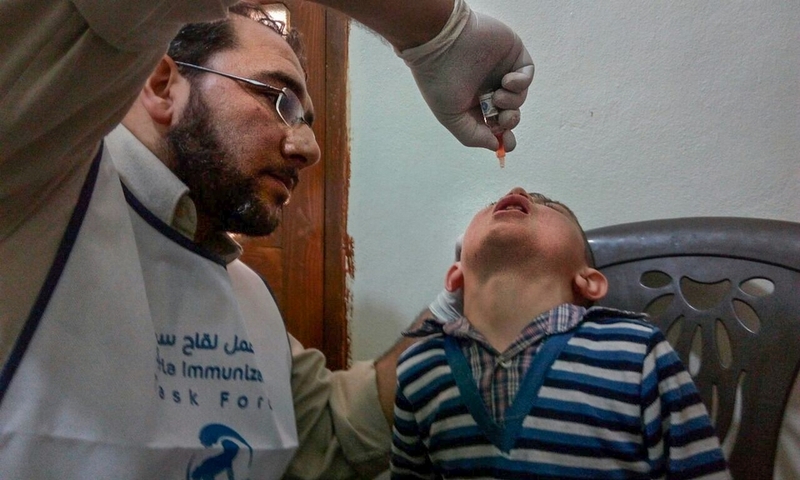 Dr. Hussein treating a child in an MSF supported hospital in east Aleppo. One main problem we see in the hospitals is that intensive care units (ICU) are overwhelmed. Some patients are forced to stay in the operating theatre because there is no space in the ICU. Ventilators and oxygen purifiers are often broken because of overload. The other day two patients died because the oxygen purifier couldn’t provide proper oxygen. The hospital has been damaged three times by bombings. The most severe incident was mid-July and the hospital was forced to close for around ten days. Most departments were affected and we worked hard to repair what we could. Then on 3 August, and again on 6 August, bombing around the hospital again damaged the facility. The hospital is running at the moment but is able to care only for the most urgent cases. People are scared to go to hospitals. They see them as potential targets. They only come to us now if it is an absolute emergency. Medical staff are suffering in east Aleppo. With the heavy load of patients, each doctor has enough work for two. They see many wounded people every day. The health staff struggle like the rest of the people with the lack of food, fuel and many basic necessities. The few hospitals left in the city are vital for people to survive. Without them, it would be slow death. We really hope to see a safe route that allows medical staff to return to the city and allows food and medical supplies to enter."